In 1981, Steven Spielberg was suffering from his first “failure” – the overblown “1941”. In fact, both “Jaws” and "Close Encounters of the Third Kind” were over budget, but since they were successful Mr. Spielberg got away with it. It was George Lucas who taught Mr. S. to shoot frugally, stay under budget and under schedule. The result was “Raiders of the Lost Ark” – one of the great masterpieces of action-adventure cinema - a movie filmed with breathless pace and energetic exhuberence. "Raiders" is the equivalent to a circus on screen – Spielberg’s hero goes through every form of death-defying act of jeopardy imaginable, via every form of transportation imaginable and all of it without losing his hat. I was about to say, the film was an unrivaled high point in post-modern adventure cinema – but coincidentally the only other film I could compare it to, was released that same year. (see the end for the answer). The film fades in from the Paramount mountain logo into a similar mountain- a real on location landmark (nowadays the manipulation of the studio corporate logo in the opening of a film is commonplace). It’s 1936 and a mysteriously hidden man leads a team of frightened followers through the jungle and into a hidden cave filled with boobie traps. The man's in search of a piece of archeological treasure - a golden idol - which sits teasingly on a pedestal, silently challenging our hero to take it. The mystery man is Indiana Jones - a scruffy bullwhipped, fedora-clad loner hero (Harrison Ford) who manages to take the idol and dodge hundreds of poisoned arrows, a giant rolling stone ball and a group of head-hunting natives. Back home at his University teaching gig Jones is greeted by a pair of government suits who inform him the Nazis have been combing the globe in search of the coveted Ark of the Covenant which held Moses' Ten Commandments. Jones accepts their mission to find the Ark before the Nazi’s can use it’s mythical destructive powers. The adventure takes Jones first to Nepal where he joins up with his old flame Marion Ravenwood (Karen Allen), before flying to Cairo where the Ark was originally buried. Jones fights the Nazis over land, sea and air, culminating in an especially gory finale, when the evil Nazi’s get their comeuppance from the ghosts of Moses and the Ark’s protectors. Spielberg and Lucas concoct this adventure from all their favourite sources of entertainment as children – cliff-hangar serials like Flash Gordon, ‘Cowboys and Indians’ action pictures, pulp comic books, even some Alfred Hitchcock suspense. Spielberg’s sense of fun comes from the self-depreciating quality which makes the Indy character so likeable. Ten years before the style came in vogue the film continually references itself without reducing the utter seriousness and drama of the journey. Spielberg, Lucas and writer Lawrence Kasdan recognize the ridiculous scenarios which one-by-one stand in the way of their hero getting what he wants. The first moment of self-reflexive irony is perhaps during the opening scene when Indy flees the falling rocks in the cave. He jumps the chasm’s bottomless pit, grabbing onto a vine. As if the jump wasn’t frightful enough, the vine loosens, almost sending him to his death in the pit– not to mention the slowly descending wall which Indy must slide under after he climbs the loose dangling vine. It’s an over-the-top scene of jeopardy and danger which could be criticized as false and contrived but it's a dizzying manipulation of our emotions which sets the tone for the entire series. The character of Jones is so clear and accessible, but still distinct, original and beguiling. He continually contradicts himself. He is both honourable and self-centred; a romantic, yet naïve and ignorant to the needs of women. And his personal scruples varies wildly depending on the situation. He is a wonderful mélange of the classic Hollywood personalities: Humphrey Bogart, Errol Flynn, James Cagney, and Cary Grant to name a few. Indiana Jones’ success is still being felt today. Twenty-eight years later Hollywood is still copying the formula of globe-trotting, pulpy adventure with self-deprecating ironic wit. 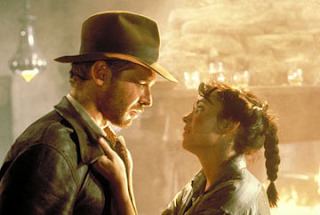 “Pirates of the Caribbean”, “The Mummy”, “National Treasure” – even “The Da Vinci Code” are products of Indiana Jones – none of which have ever come close to the magic of excess which Spielberg perfected. Enjoy. That other comparable film release the same year as “Raiders” is George Miller’s “The Road Warrior” Check it out.